James “BJ” Mottu is a 2017 Livingston High School Graduate and former 4-year member of the LHS Power Lifting Team. He began training with Tiny Meeker @ Monster Gym in February 2018, prior to that he self-trained at LFC with occasional assistance from Coby Piper & Grady Reily. State record for Bench Press in the 20–25 year-old 181 lb weight class was 330.5lbs, BJ smashed the State record with a lift of 358.2lbs. BJ is the son of Nelson Barbee & Misty Crabtree of Hearne, Texas, brother of Joey Mottu and the grandson of Conna Draughon both of Livingston. Dakota “Big” Piper is a Senior at Livingston High School and is a 4-year member of the LHS Power Lifting Team. Dakota began training with Tiny Meeker @ Monster Gym in November 2017, prior to that he self-trained @ LFC with occasional assistance from Coby Piper and Grady Reily. 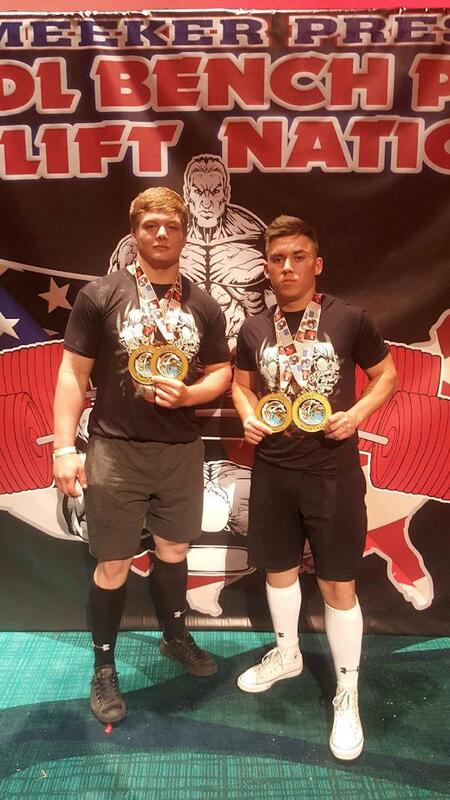 Dakota set the following record on April 7th: State Record for Dead Lift in the 18-year-old, 220 lb class was 551 pounds, Dakota shattered that record with a lift of 575.8 pounds. Dakota is the son of Bubba & Coby Piper, brother of Montana Piper, and grandson of Coach John & Jean Taylor and Joyce & the late “Butch” Piper. Both young men are set to compete in the WABDL World Championships November 13th – 18th at Bally’s in Las Vegas, Nevada.